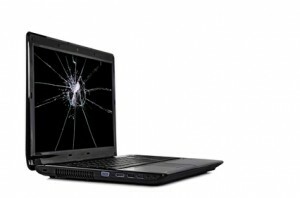 Laptop Screen Replacement is usually a very worthwhile. If done for the right price. Call us on 0754 919 998 for a replacement quote that is likely a lot less than you expect. If you are looking for Replacement Screen for Laptop in Caloundra on the Sunshine Coast, then Tech Aid is a great place to get your cracked screen fixed. We can replace the LED or LCD panel on average between $170-$200 including labour. Most decent laptops are between $500 – $2000 and this can be a far cheaper option than replacing the whole laptop. As you also need to consider transferring all your data off the old laptop and onto the new one, not to mention all your programs and updates. However if you would prefer to replace the machine we will be happy to provide a quote, we usually also offer a trade-in on the old laptop. * Macbook screen repairs are for Mac’s that are out of warranty! If your apple mac is under warranty check with your supplier first. This happens usually as a result of either fall damage or being dropped. Sometimes as a result of being stood on, or closing the lid while a mouse is sitting on keyboard. If you have had one of these accidents, don’t worry, you shouldn’t have lost any data, documents or pictures. Although, data loss and corruption can happen, especially if the laptop is powered-on when it’s dropped, causing damage to the internal hard drive. – Using the laptop on your lap – this can cause overheating, or accidental drop. – Leaving it on the floor – kids don’t tend to realize that standing on it is a bad idea (personal experience). – Leaving your mouse sitting on the keyboard – someone may close it on you, causing the screen to crack. Every laptop uses a different screen component, and some laptop models have various screen models too, so every replacement job is a different price, so give us a call or drop in with your laptop and we can custom quote to have the screen replaced, and have it back to you like new. Head to our contact page for all our contact details.